The Smash-Tech Line thru Bluegill is one of the most detailed and realistic swimbaits on the market. 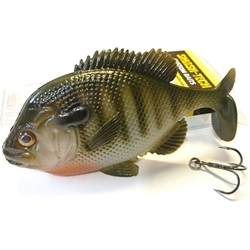 At 5.5 inches in length it is the perfect size to imitate the forage that big bass love to feed on. Featuring a multi step airbrushed paint job, a custom tin insert that won't discolor the bait like the cheaper lead inserts and a premium Owner Stinger treble hook it is ready to fish right out of the package. Whether pitched to a bed, slow rolled over submerged vegetation, or fished around sunfish spawning areas, the Smash-Tech Line thru Bluegill is sure to become your favorite bluegill imitator.